Es gibt über 130 Gruppen (sogenannte Inns) an juristischen Fakultäten in den USA, Kanada, Mexiko, Polen und Deutschland. Die Inns werden bei der Gründung jeweils nach einem bedeutenden Juristen benannt, der den Mitgliedern fachlich und ethisch als Vorbild dienen soll. Wohingegen in den USA die einzelnen Inn oftmals die Namen von Bundesrichtern und Senatoren tragen, standen die ehemaligen Bundespräsidenten Herr Prof. Dr. Roman Herzog sowie Herr Dr. iur. Dr. h.c. mult. Richard Karl Freiherr von Weizsäcker Pate für die beiden ersten Inn in Deutschland, welche am 30. Oktober 2006 an der Bucerius Law School in Hamburg und am 03. Oktober 2008 an der Eberhard-Karls-Universität in Tübingen gegründet wurden. Diesem Vorbild folgend, wurde im Jahr 2012 das dritte Inn an der Ludwig-Maximilians-Universität in München gegründet. Als Namenspate konnte Herr Prof. Dr. Dres. h.c. Hans-Jürgen Papier (Präsident des Bundesverfassungsgericht a.D.) gewonnen werden. Ein Jahr später gründete sich im Oktober 2013 das vierte Inn an der Goethe-Universität in Frankfurt am Main. Als Namenspate konnte Herr Prof. Dr. Michael Hoffmann-Becking gewonnen werden. In allen Gruppen besteht als Aufnahmekriterium ein Mindestnotendurchschnitt, der die Gruppe der Kandidaten grundsätzlich zur Mitgliedschaft auf das obere Drittel beschränkt. Während der über 130 Jahre des Bestehens hat keine andere Studentenvereinigung in den USA so viele Mandatsträger hervorgebracht. Es finden sich unter den Mitgliedern von Phi Delta Phi mehrere US-Präsidenten, zahllose Supreme Court Richter (sehr häufig sind mehr Mitglieder als Nicht-Mitglieder am Supreme Court zu finden), Senatoren, Kongressabgeordnete und einflussreiche Mitglieder des juristischen Standes. Unser Province President für Zentraleuropa, Dr. Johannes Fridrich, steht den jeweiligen Inns, den Magistern, dem Vorstand des jeweiligen Inns und dem Assistant Province President vor. Er hat ein umfassendes Weisungs- und Informationsrecht und vertritt die europäischen Inns in Europa gegenüber Phi Delta Phi und dem Headquarter in den USA. Der Assistant Province President N. N., vertritt den Province President in Europa. Er zeichnet sich dafür verantwortlich, dass die Vorgaben von Phi Delta Phi auf nationaler Ebene eingehalten und umgesetzt werden. Hierfür steht der Assistant Province President mit den Vorständen der einzelnen Inns und hier im Wesentlichen mit dem jeweiligen Magister in engen Kontakt. Die Farben der Vereinigung sind rot, blau und gold. Sie stehen für Mut, Treue und Würde. Das Motto der Vereinigung ist „Friends of Justice and Wisdom“. Gules, a death’s head affronte debruising two femur bones crossed saltierwise argent, on a chief azure an owl (scops gin) erased with wings displayed or. The Shield surmounting two swords crossed salterwise proper. On a wreath of the colors a human forearm proper holding aloft a Latin cross with end members debruised by mullets and supporting ornaments and balances to form a scale of Justice, all or. Debruising is a Heraldic word meaning placed over or upon- thus, the skull is placed over or upon. This further carries out the idea of the death’s head described above. The two femur bones, however, refer to the two principal divisions of the Honor Society, namely the students and barristers. The close and friendly relationship which exists between these two groups being indicated by the equal division formed by the diagonal or saltierwise crossing. It is represented in monotone by a plain area with no marking as bones exposed to the elements become bleached and whitened. White is the color of purity and innocence. Its use in this connection is emblematic of the purity of motif in all of the dealings Phi Delta Phis have with each other and furthermore, that each should hold aloof from any questionable dealings and that their purpose should ever be to protect the innocent and see that Justice be done. The third of the shield divided horizontally is known as the chief. In the old days that portion of the shield protected the chief parts of the Knight’s person – the heart and head. The Heralds, always quick to interpret these things in appropriate symbolism, set this space aside for these symbols of great importance. The Heraldic term for blue. There was but one shade of blue in Heraldry but here it represents the pearl blue of the Honor Society colors. Blue is the color of loyalty and friendship which is the basis of the Honor Society’s life and infused in the basic attributes of the group. The owl is sometimes known as scops gin. It is an ancient and revered symbol of learning and wisdom. It has become closely associated in the minds of men with the law because of this two fold symbolism. The law requires a perfection in learning for it is not only necessary to master the facts of a case but also to turn one’s mind back into the pages of history to exhaust the statues and decisions of the ages; and the law required wisdom, a knowledge of psychology, and human nature which assures a correct interpretation of laws and an application of their mandates to the ends of Justice. Only a part of the bird is shown. Describes the position of the wings as raised on either side. In this manner they cover most of the chief and produce an all encompassing affect thus alluding to the protective influence of learning and wisdom as exemplified in the administration of the law. Or is the Heraldic term for yellow or gold. Gold is called the most noble of metals and its use her refers to the nobility and dignity of the legal calling as well as the golden opportunities which abound on all sides of the lawyer to serve humanity. The one sword is symbolic of the force necessary at times to carry out the ends of justice, and the other is ever remindful of the seriousness of the Phi Delta Phi obligation. The crest is only that part of the coat-of-arms embracing and extending above the torse or crest wreath. This refers to the torse or crest wreath, a conventionalized twined ribbon consisting of six parts of divisions and alternating in color – blue and red. Many students of Heraldry believe that it is reminiscent of the wealth which was placed upon the helmet of the victorious Knight, and as such it is symbolic of the ultimate reward of all members of the Honor Society who daily strive to promote the cause of Phi Delta Phi. The representation of the arm of Justice. Shown in natural color values. 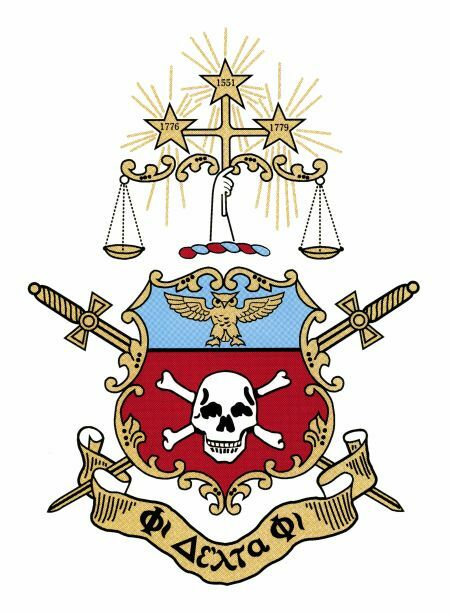 The Three Mullets or five pointed stars indicate the three important historical dates to Phi Delta Phi, 1551, 1776, and 1779, the birth dates of the three great legal scholars, Coke, Chitty, and Story. The Ornamental Work and Balances form a scale of Justice indicating the reverence for Justice and emphasizing the common interest in law and its administration. The war cry or motto was usually placed on a scroll at the bottom of the coat-of-arms and so the Phi Delta Phi name “Friends of Justice and Wisdom” is displayed.